Push notifications have been touted for quite some time as the key for brands to distinguish their app from the sea of apps on a user’s phone screen. They have been praised as a fresh way for marketers to increase user retention and drive re-engagement. As mobile usage continues to rise at an unprecedented rate, push notifications seem to be the glass slipper marketers have been waiting for. So why hasn’t everyone jumped onboard? There has been much debate around the effectiveness of push notifications and push marketing in general. How effective are push notifications? Do people really find them useful? Push notifications will interrupt and distract the user from whatever they are doing. They’re intrusive—users who want push notifications will enable them on their own. The expectation of an immediate response can drive users away from an app rather than back into it. However, although push marketing may initially come off as invasive and unwanted, the stats tell a very different story. According to this study, 61% of new app users receiving push notifications launched the app within the first month—more than double the 28% of installers who did not receive push notifications within that timeframe. eCommerce apps, in particular, saw a 278% increase in launches among users with push notifications enabled vs. disabled. In fact, Facebook has seen a dramatic increase in visitation from launching push notifications. When done right, push notifications can boost app launches, engagement, and retention. But much like our research indicates, do them wrong and you will increase app uninstalls, opt-outs, and you will create a very bad association with your brand. The question we all want to be answered then is: how do you create push notifications that are beneficial— both to your customers and to your business? The marketing minds behind some of the most beloved apps out there have figured out how to leverage push marketing to their advantage. But many of these apps—like Netflix, Waze, and Uber—enjoy the advantage of a high-frequency user base. What if you’re in an industry with low push engagement rates? Retail apps, in particular, are struggling to generate more app engagement using push notifications. According to this study by Mixpanel, eCommerce apps only have a 13% retention after 1 month. 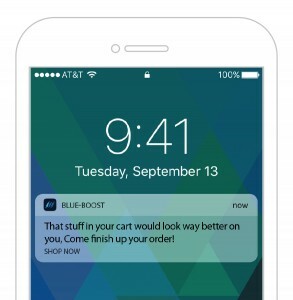 As an eCommerce marketer, how can you tackle the push notification problem? People want personalized, relevant push messages. They can easily sniff out generic, blasted messages that are part of an obvious re-engagement campaign. Getting a meaningless push message is an annoying distraction, and getting too many of them can lead the user to stop buying from you altogether. Personalizing the content of push notifications, however, can deliver a 4x lift on open rates. One very effective and unconventional approach to personalizing push messages is to serve recommendations based on the products the user has shown an affinity for in their browsing and buying history. If a user’s behavior demonstrates that they are in the market for specific items—e.g., they viewed and interacted with women’s sneakers and workout apparel— then they can be served those items in the notification itself. What’s more, deep linking to these products within your app enables users to act on the push notification instantly, and drive increased conversions. Instead of opening the home-screen, users will find the push notification to be increasingly relevant when it lands them directly on the product displayed. If you’re like me, the last thing you want is to be woken up your phone buzzing at 2AM by a push message from an eCommerce app. The stories of badly-timed push notifications abound. 63 percent of marketers completely miss the mark on messaging, timing, and the frequency of their push marketing efforts. The solution to the timeliness problem is to customize delivery time according to demonstrated behavior. As Andrew Chen puts it, this means sending the push notification at the time each user is most likely to engage with your app, based on the actions they have already taken within your app. When is the right time to send the message? You can start by creating conditions to send the push based on the user’s most active or last active period. For example, if a user has a history of launching the app at 6 PM but purchases around 8 PM, then marketers can create conditions to send the push message at 8 PM when the user is most likely to purchase. The solution to the location problem is to segment users by geo-location and send messages according to each user’s local time zone. Marketers can even tailor specific promotional messages based on user’s local weather conditions. It’s also important to point out that location-based notifications do not have to be limited to online shopping: retailers with brick and mortar stores can encourage physical store visits by triggering an incentivizing push notification to users that are nearby. Combating shopping cart abandonment is a major challenge for all online retailers, and this is especially true with mobile. It goes without saying that mobile shopping cart abandonment rates are horrendous, at 97%. Shoppers abandon their carts for a number of reasons (be it high shipping costs, more affordable alternatives, window shopping etc.) and while sending cart abandonment emails is an invaluable tactic to recover sales from abandoned carts, open rates for push notifications are 50 percent higher than for email, and click rates are up to twice as high. 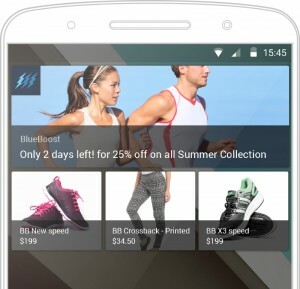 You can proactively increase mobile conversions by pushing notifications to a segment of users who abandoned your mobile website or app after beginning checkout. Most apps don’t have a cart abandonment strategy in place and have no way to nudge users to complete their purchases. Reminding users that they have unpurchased items in their carts is a critical tactic to win back those lost purchase opportunities. Data from Responsys shows that 50% of users enable push notifications to gain access to special deals or exclusive offers. Offering limited-time or offers discounts can be a highly-effective way to lure latent users back into your app. As always, the decision to offer a discount needs to make sense for your business. Don’t just send discounts to everyone—we recommend starting with latent users. For example, you could create a promotional push campaign that is scheduled to run once a week targeting anyone who has not been on your mobile website or app for more than 10 days. If the individual uses the discount then they should automatically be removed from that segment of latent users receiving discounts. If the user ignores the notification, they can receive it again next time your automated campaign runs. To ensure users aren’t receiving endless amounts of discounts, marketers must leverage automation solutions that cap the amount of messages each user receives. Push notifications are one of the most effective ways for eCommerce marketers to incentivize re-engagement with mobile apps and drive retention. Perfectly-timed and personalized push notifications delight customers while irrelevant and spammy push messages will drive them away. It’s critical to keep in mind that push notifications—like all 1:1 messages—are an ongoing interaction with your customers that must be tested and optimized. Make sure to monitor your customer data over time to understand the effect each push notification has on different user segments and the role push messaging plays in your overall marketing strategy.